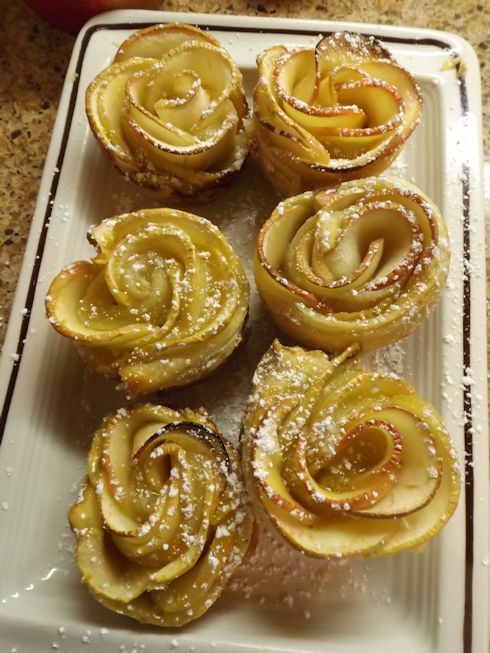 I have seen these Apple Rose Pastries on the internet and since I just got back from Apple Land yesterday, I wanted to give them a try. I watched some German lady on Youtube making them today. She spoke very rapidly and ironically the only thing she said that I could understand was “Pink Lady” and as luck would have it, that’s precisely the kind of apples I bought in Ellijay. After I watched the video, I went to the grocery store and came home with the 4 ingredients I needed and about $100 worth of other ingredients not on the list. You know how it is. Place the package of puff pastry out on the counter to thaw about 30 minutes before baking. Grease a 12-cupcake tin. Preheat the oven to 375 degrees. Core and halve the apples. Place the apples cut-side down on a cutting board. Slice the apples into very thin slices. The slices should be thin enough to bend. Place the apples in water with the juice of 1/2 lemon in a glass bowl as you slice them. 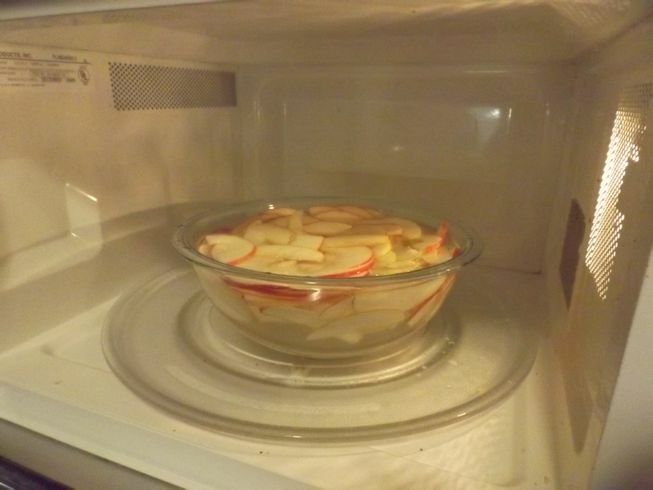 Microwave the bowl of apples with the water for about 7 minutes or until slightly tender. You don’t want them soft and falling apart. Drain apples and pat dry. 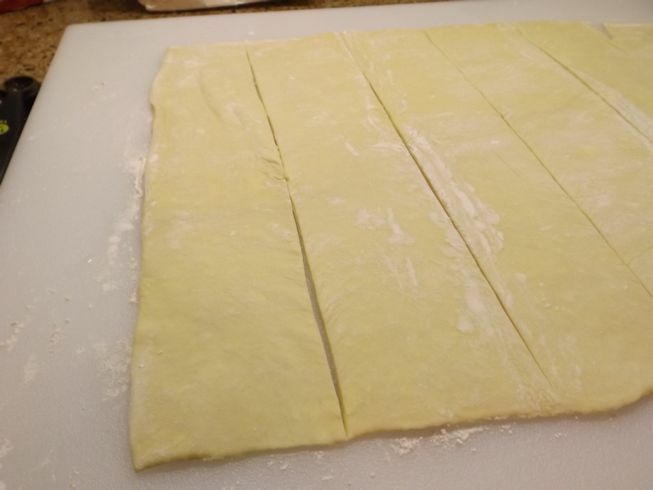 Next, place a little flour on a counter or pastry board and roll out the length of the puff pastry to 12 inches. Cut into thirds with a sharp knife where you can see the original indentations of the folds and then cut each piece into two for six pieces. In a small bowl mix together the apricot jelly, cinnamon, turbinado sugar, and water. Spread half of the jelly mixture over the 6 strips of pastry. Arrange 6 or 7 apple slices on the top half of the strip overlapping to about half way on each apple. Fold the bottom half of the dough over the bottoms of the apples. Roll up the apples and pastry and place in a greased cupcake opening. Repeat with other layers and with the second puff pastry. Bake at 375 degrees for 35-40 minutes or until puff pastry is cooked. Immediately remove pastries from the pan as they tend to stick easily. Sprinkle with powdered sugar. 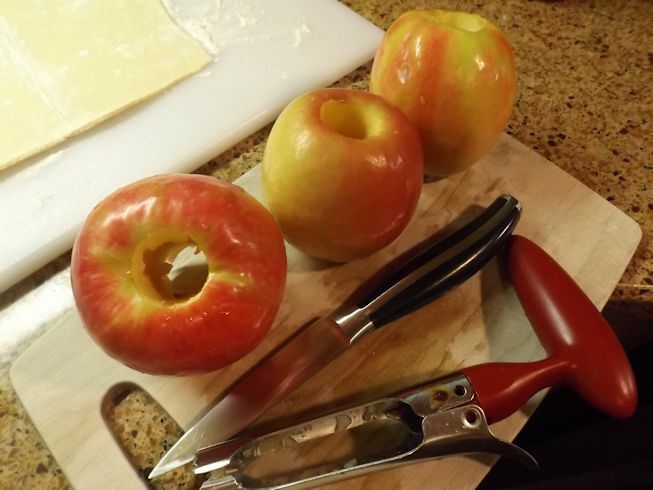 I used an apple corer, but you can just use a knife if you don’t have an apple corer. You have previously seen my kitchen gadget drawer so you had to know that I would have an apple corer. 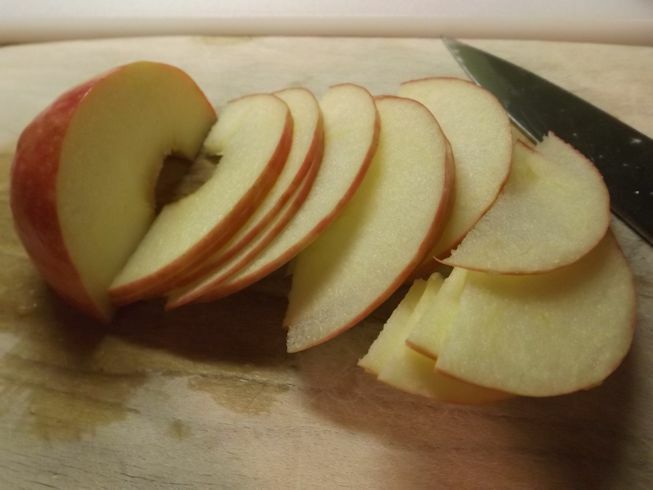 Cut the apples into THIN slices. A sharp knife is a must. Place the apples in lemon water and then microwave about 7 minutes. Drain and pat dry when ready to use. Next, roll out the puff pastry on a lightly floured surface to 12 inches long. 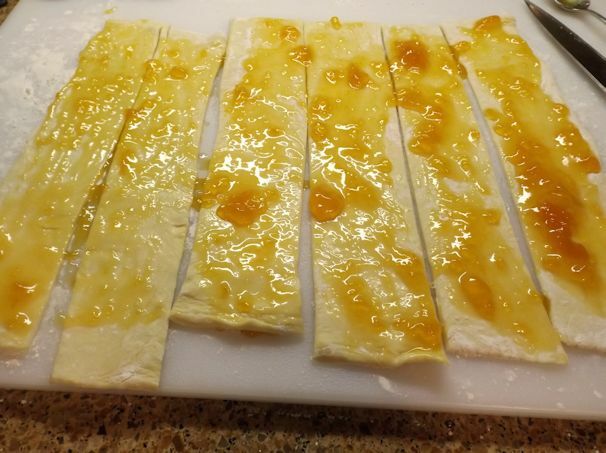 Cut each pastry into six strips. Mix the filling ingredients and spread on the strips. Hang in there and don’t lose sight of the prize. 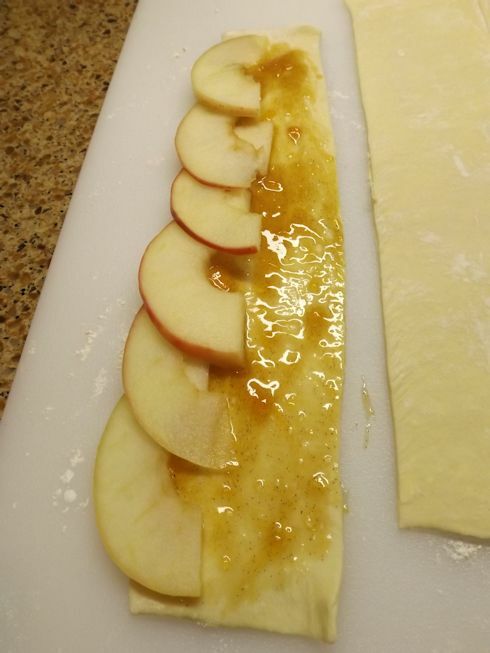 Next, arrange apple slices on a strip of pastry. I used about 6 or 7 for each strip. 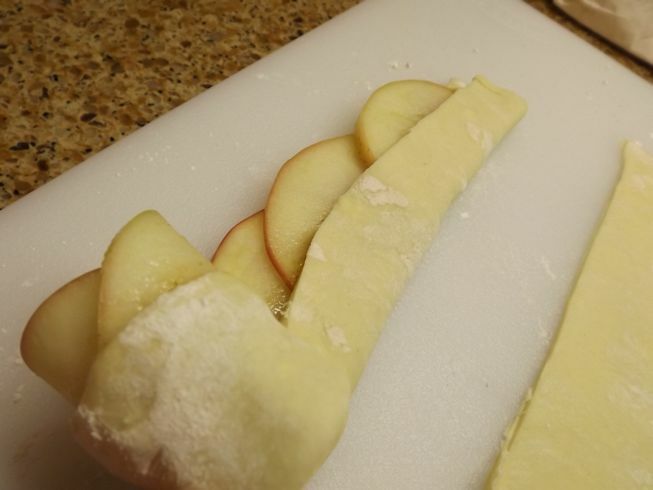 Now, fold over the strip of pastry onto the bottom of the apples. 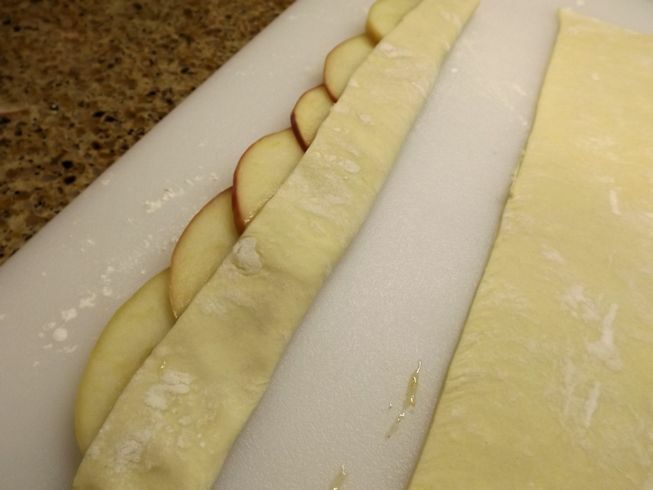 Roll and tuck apples back in pastry if necessary. Place each roll in a cupcake tin opening. Bake about 35-40 minutes until the puff pastry is cooked in the center of the roll-up. You can see if it is done or not by looking at the texture. When done, take the pan out of the oven and IMMEDIATELY begin removing the pastries from the cupcake tin. It doesn’t take long for them to stick. I tried cupcake papers but they stuck to the pastry, too. I might try silicone cupcake pans next time. Whatever you use, JUST GET THEM OUT OF THERE PRONTO! 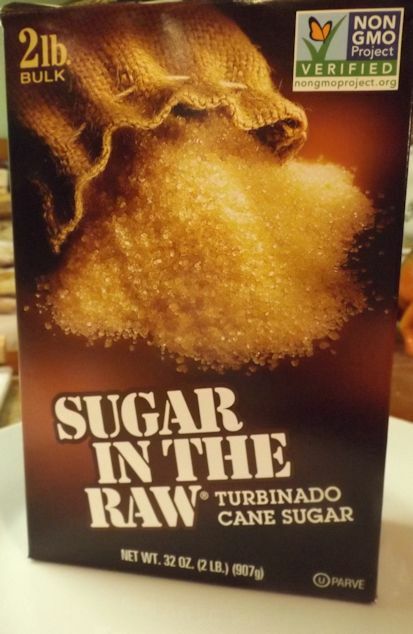 Allow to cool slightly and sprinkle with powdered sugar. What’s my opinion? I liked them but I would also like to play with the recipe a bit more. My main complaint was that the apple skin got really tough and was hard for me to chew. I would like to try peeling the apple first but then you wouldn’t have that pretty rose look with the color of the skin. An apple conundrum, I guess. You also have to be sure that the puff pastry is cooked through. If you look at the one in the middle on the left, the puff pastry didn’t quite get cooked on that one. It was a little too gummy. Would I make them again? Sure! 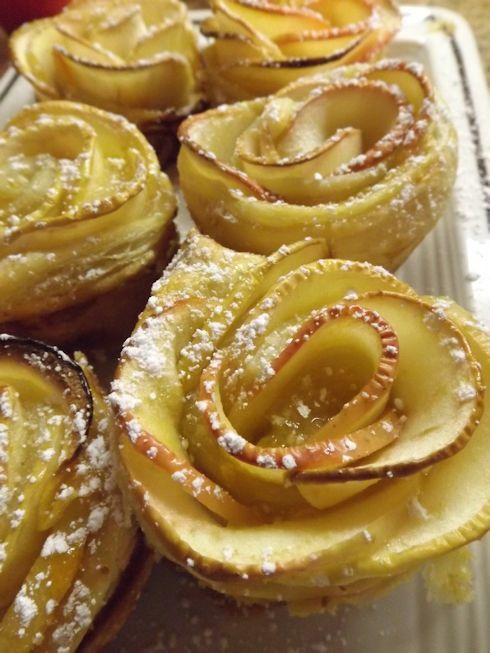 They are pretty and I enjoyed the taste with the apples and apricot jelly. And honestly, I could roll anything up in puff pastry and I would probably like it. Possibly not squid or green peas (my two most dreaded foods) but you never know. The Power of the Puff might be too strong to resist! 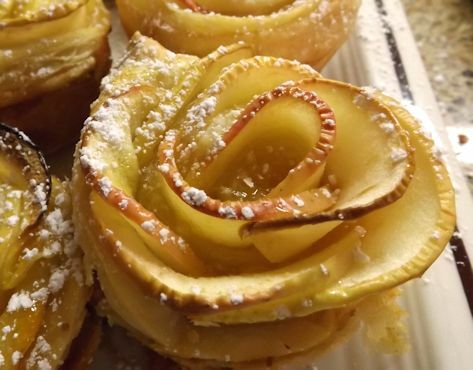 The apple roses are fabulous…they look delicious…would be good as are and fun as a garnish …love your blogs.